It could not get bigger than this as India set a semi-final clash with archrivals Pakistan on March 30 in Mohali.The India-Pakistan rivalry in the World Cup is all about some high-voltage cricket and emotions running very high.The two teams have faced each other four times in the 50-over mega-event, and each time India has finished on top. But none of the matches was smooth sailing and lived up to the hype of a classic India-Pakistan encounter. This was the first time when the two arch-rivals faced each other in the World Cup. Emotions were running high at the Sydney Cricket Ground. Winning the toss, India opted to bat and scored 216 runs with the help of a half-century from Sachin Tendulkar. India pulled off an easy win after Indian pacers bowled out Pakistan for 173 runs. This match had its moment when Javed Miandad, irked by constant sledging and jeering by Indian keeper Kiran More, mimicked his antics. More was continuously appealing against Miandad and the Pakistan batsman lost his calm. There were some heated verbal exchanges between the two players but the umpires did not report the incident to the match referee since they could not understand the language of the verbal duel. India and Pakistan were playing each other in the quarter-final, which meant the defeated team would have to go back home. Winning the toss, India posted 287 runs with Navjot Singh Sidhu making 93 runs and Ajay Jadeja scoring 45 runs. Chasing the target, Pakistan skipper Aamer Sohail rubbed Indian pacer Venkatesh Prasad the wrong way. He tried to unsettle the bowler and disturb his rhythm, a ploy that backfired. Though he scored a half-century, Pakistan needed much more from their captain. He hit Prasad for a cover boundary and pointed towards the region as if he was saying ' I'll hit you for more like these'. With the very next delivery, Prasad avenged the humiliation. Aamer failed to read his good-length delivery that came back in and uprooted his off-stump. On the hindsight, had Sohail just curbed his passion for a little longer, the Indo-Pak World Cup stats might just have been very different. It was perhaps the most inappropriate time for India and Pakistan to play since the two countries were at war in Kargil. The temperature was soaring at the otherwise serene Old Trafford in Manchester. Heavy security was deployed in the ground and by the end of the match there were three arrests, nine ejections, and one Indian tricolour burned. But the ambience that the rival fans created with flag-waving, whistle-blowing and drum-beating was awe-inspiring. Electing to bat, India posted a total of 227 runs. Rahul Dravid and skipper Mohammad Azharuddin slammed half-centuries while Sachin Tendulkar fell short of his fifty by 5 runs. In reply, Pakistan were bundled out for just 180 runs. Saeed Anwar started the procession on a positive note and made 36 runs. Inzamam ul Haq bettered Anwar and scored 41 but that still wasn't good enough. 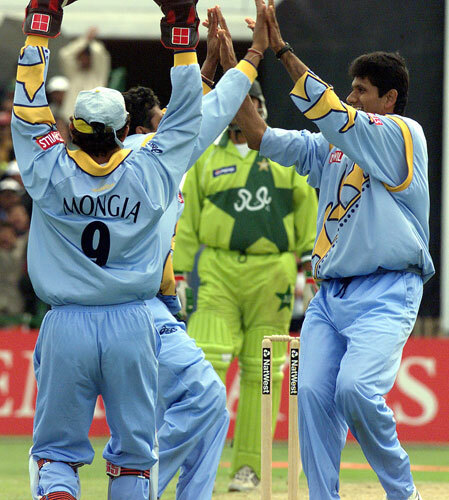 Venkatesh Prasad and Javagal Srinath made merry as they picked 5 and 3 wickets respectively. Their Bangalore teammate Anil Kumble took two wickets. The arch-rivals were playing each other after a gap of three years. And the relations between the two countries had turned sour after the Kargil war. On March 1, the India-Pakistan match became the virtual final for the fans from both the sides. Before the match, Pakistan fast bowler Shoaib Akhtar sent out loud warnings to Sachin Tendulkar. When prodded for a reply, the master batsman said he would let his bat do the talking. And his bat roared in Centurion. Needing 274 runs to win, India were off to a flying start with Sehwag and Sachin firing all cylinders. The Indian openers thrashed the high-profile Pakistan bowlers (Wasim Akram, Waqar Younis, Shoaib Akhtar and Abdul Razzaq) all over ground. But Akhtar's nightmare came true when Sachin slashed one of his deliveries over the point region for a huge six. 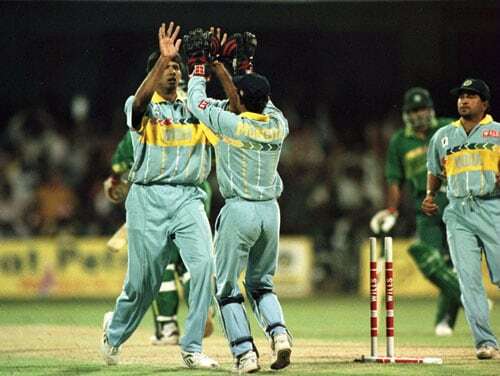 With that shot Sachin punctured Pakistan's confidence and paved the way for India's victory. Though Sachin fell short of his well-deserved century by 2 runs, his knock of 98 runs off 75 balls is widely regarded as one of his best ODI innings. social service and pakistan cricket team if any they do please write or just forward me link. both are equal in this zero. 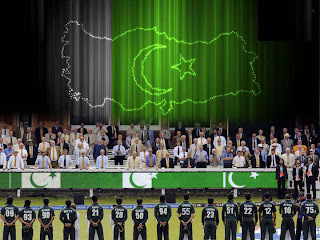 I really really really wish and pray that Pak wins this match against india InshaAllah. This is a wonderful way for the neighbouring countries to compete. It really doesn't matter which side wins as long as there is mutual respect and everybody enjoys a thrilling game from two of the world's best teams.